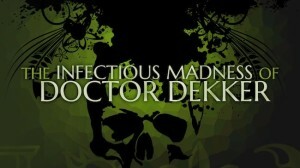 As for The Infectious Madness of Doctor Dekker (please, PLEASE pick a shorted title for your next game!) it’s a moderately diverting few hours once you push past the initial few hours of undirected play and moderate belly-button gazing. he number of FMV based titles has exploded recently. 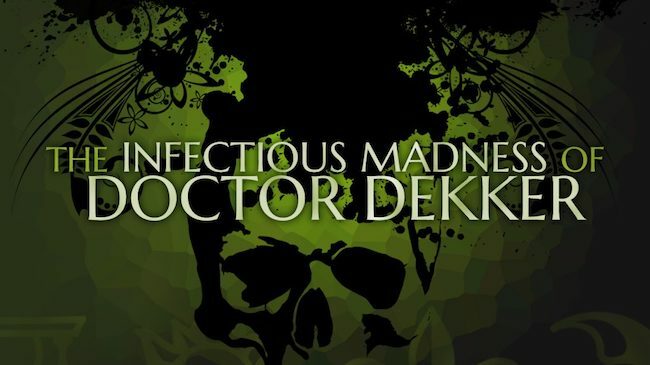 Having just reviewed Late Shift we’re on somewhat of a roll with Wales Interactive titles, so how does The Infectious MAdness of Doctor Dekker stack up? You assume the role of a newly appointed psychiatrist. 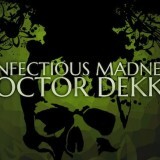 Taking on the patients of the recently departed Doctor Dekker. You’re there to support your varied patients, but also a bit of amateur sleuthing never hurt anybody, right? The entire experience takes place in basically one location. You’re sat at your desk, looking towards a large couch where each of your patients, or your assistant, sits in turn. Each section of the game is split in to a day. Each day you are given a set number of patients to talk with. Here you can question them about their wellbeing, general mental health, what brought them to Doctor Dekker in the first place and what they know about Dekker and his murder. The questions can be picked from a selection of possible topics. These will change in line with your questioning and certain avenues are opened up or cut off depending on what you ask and what you reaction is to a patient’s questions / replies. As well as this there’s an accessible notebook that keeps track of salient points and allows you to cross check them at any point. There’s a hint system as well offering up suggestions as to which line of questioning might be the most beneficial to your quest. As well as these defined responses you can also enter free-form questions using the onscreen keyboard or a bluetooth one. This was the whole original premise of the game when released on the PC and is the games biggest selling point and largest drag factor on console. This sometimes allows you to delve further in to a certain aspect or topic with a character that the predefined questions do not allow. The system is limited ( as you might expect from this sort of system), you have to hit the right keywords to elicit the response you were looking for, but can be a nice extra tool at your disposal – more often than not though you will get all you need from the predefined responses up to the amber level….. Ah yes… each character has a stop-light based system for displaying their trust in you. Red is closed off, amber means they’re opening up and telling you some things, green means they trust you completely and give you the most information possible. This system varies throughout based on your questions and reactions. As you slowly build up a picture of each character you can start to formulate in your mind who you think the culprit most likely was. 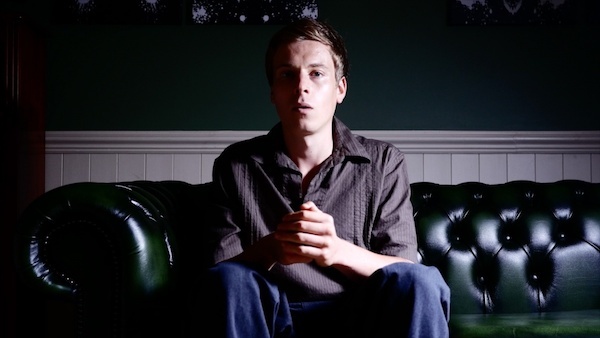 The murderer is randomised each round of the game, adding a little longevity to the mix. Most of the characters are interesting and well realised, with the performances ranging from drama club to reasonable TV quality. Most have a good depth to them with at least a more than superficial back story to justify their inclusion. Due to the static nature of the set used, which is well realised to be fair, things feel a little stale and long plays feel like a listless chore at times. The quality of the video capture, as this is all about he FMV, is very good. Well lit in the most part, good variety to costume and set design with a nicely implemented user interface (something some FMV titles neglect terribly) that makes it simple to navigate to all your patients and, keyboard issues aside, makes it simple to quiz them and access your notes. The random nature of the gameplay and a slight disjoint in some scenarios can jar a little – the game has to account for things you may or may not have asked and reactions and body language as a result can be a little ‘off’. The Infectious Madness of Doctor Dekker tries to offer up a mixture of Her Story and a murder mystery and never really hits the stride of either. 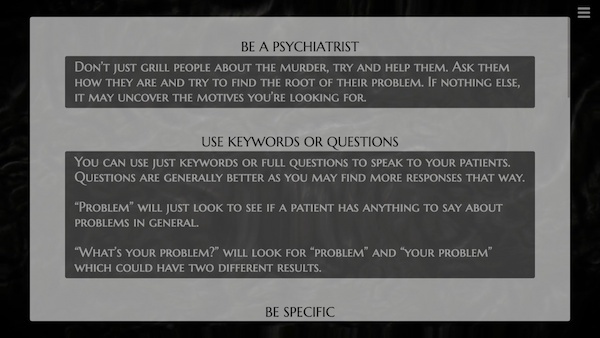 The random nature and lack of initial direction means the game is very lite on the murder mystery side of things. Leaving you feeling more like you’re playing an analyst sim early session can feel listless and mundane. Digging in to the story a little more and investing in the characters helps this but it never really pulls of either aspect to a significantly impressive level. Solid enough acting, well shot (well 95% of it is in a single location after all) and reasonable direction all help bring the experience to life and the general presentation of solid indeed. Doctor Dekker has some neat ideas and makes a good stab at trying to achieve those. It leaves something to be desired in a few areas but opens up a possibility for the developers to iterate on these aspects and hopefully nail the next title they produce. The nature of the questioning, the random killer and the interesting characters do lend themselves to more than one play although I feel the shine won’t last more than a 2nd trip through.